We specialize in guiding and teaching fly fishing for trout and smallmouth in Western North Carolina & East Tennessee. Most fly anglers who have fished for trout a few times or more understand that most of trout’s diet is consumed sub surface. I have heard stats that suggest trout consume over 90% of their food under water. That means a Thingamabobber with split shot or a heavy Czech nymph rig dragging the flies to the bottom will work all the time right? While nymphs on the bottom (we have a blog post on adding split shot coming out early in 2015) will often work that is not always true. Fish in lakes suspend in the current why wouldn’t river trout? The answer is they do and nymph fishermen often miss out on those fish that are in the middle of the water column. I was guiding a few weeks ago and could see trout feeding and couldn’t catch them with my standard nymph rig (nymphs within 12 inches of the bottom). I saw an occasional trout rising and more trout darting back and forth in the riffles feeding. A long time ago I learned that I must change not just flies, but rigs whenever I am not finding success catching fish. So we took the strike indicators off our leaders and switched to a Parachute Madam X Dry Fly with a Soft Hackle about three feet deep tied off the bend of the PMX Dry Fly. Many of you know this rig as a hopper and a dropper or less specifically a dry dropper. We instantly started catching trout on both the dry fly and our dropper nymph. We had the exact same soft hackle on our nymph rig, but it wasn’t getting eaten. I knew they were eating caddis pupae and that the soft hackle should work because I saw caddis pupae in a stomach sample I had taken earlier in the day. Obviously we had the right fly in the wrong part of the water column. As soon as we got the fly off the bottom and in the middle part of the column fish nailed it. They also ate our dry fly. There were no hoppers or stoneflies out, but the trout were only a few feet from the surface and were opportunistically taking our dry. This great dry dropper action lasted a few weeks, but I still do catch most of my fish under strike indicators close to the bottom. I do always remember to try dry dropper rigs if I get stumped nymph fishing, and usually have a couple extra dry dropper rods rigged in my boat so I can switch easily. If you don’t have the luxury of carrying two rods try the ORVIS dropper box. It lets you pre tie Dry fly and Droppers and carry them tangle free. Below are links to an ORVIS Blog article from Cliff Weisse of Three Rivers Ranch on how to rig dry droppers and a link to the ORVIS Dropper Box. We get a ton of requests for wade fly fishing trips during the summer months and it makes sense because many tourists flock to the mountains to escape the heat and the idea of standing in a cool mountain stream is very appealing to all human senses. The problem is that what is cool to us as humans isn’t necessarily cool to trout. The trout fishing world generally accepts that trout feeding slows down as the water temperatures climb into the mid 60s and drastically slows at 70. There are exceptions to every rule and our guides find we can fool trout and successfully release them in these temperature ranges, but we don’t get the number of eats we would like to for our clients. 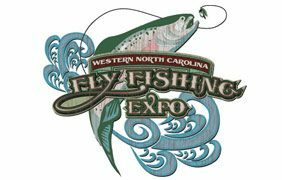 During the summer the small North Carolina trout streams that were teaming with insect life and feeding fish in May have temperatures approaching 70 every day. We still catch fish, but generally %50 fewer fish than we do fall, winter, spring. For some of our clients that is ok. They really want a wade fishing experience and are happy to be out on the water in a beautiful place and catch a few fish in the process. 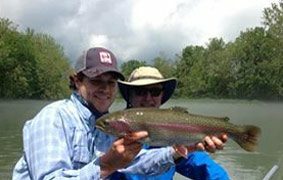 For those clients who want to see a trout river at the peak of its fishing potential the Watauga and South Holston tailwaters in Tennessee are the place to be during the summer. A tailwater trout river is fed by a deep reservoir that supplies cold water from the bottom of the lake upstream. That means even during the heat of the summer we have water temperatures that are in the optimum feeding range for trout and the insects they prey upon. Many of our clients ask why Tennessee? The answer is that the only tailwater river in North Carolina with cold summer temps is the Nantahala. It is farther from Asheville than the Tennessee rivers and has a million whitewater rafters during the summer. 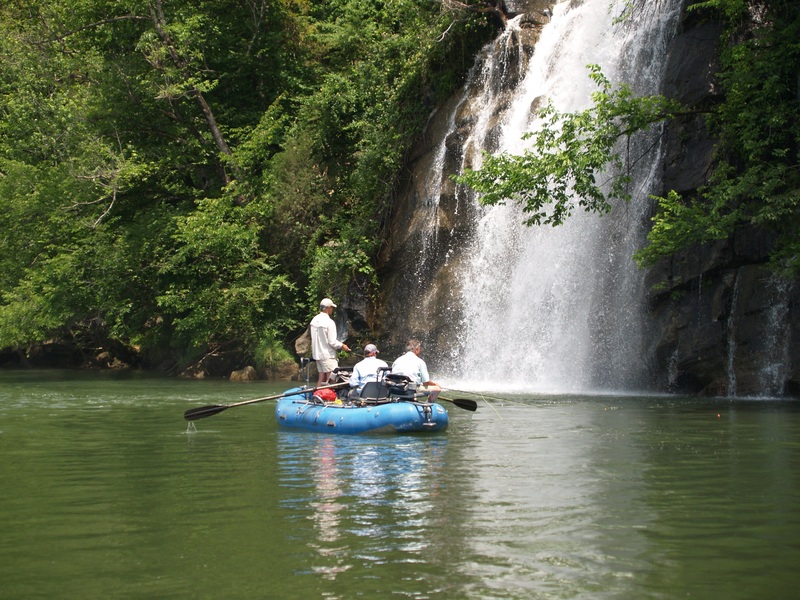 The Watauga and South Holston are big rivers that are most productively fished from a raft or drift boat. That allows anglers and guide to move from spot to spot on the river efficiently and stealthily. They also are wide open and allow easy casting with out worrying about constantly snagging trees. We are now offering summer half day and full day fly fishing float trips. Half Day trips are $350 and include 4 hours of fishing and a light lunch. Full Day trips are $425 and include 7-8 hours of fishing and a shore lunch. At the end of every fishing trip, on my drive home, I think of ways I could have gotten my clients to catch more fish that day. Should I have recognized a feeding pattern faster? Could I have taught them a new angling technique? At the end of the season I go through the same ritual only magnified. I found many things last year that I can improve upon. One of the areas of my improvement I thought would benefit a large portion of the angling community. I noticed lots of days of good fishing (lots of eats) didn’t produce the number of fish in the net I wanted. My clients were casting and mending well, but losing trout between the eat and the net due to slack line. I always teach beginners to immediately put the line under their rod hand trigger finger the instant the fly hits the water. It is often awkward at first, but becomes instinctive after a short time. That is the most important tip I show them all day. It often translates the first eat into a landed trout, and frequently can double the number of fish they land. 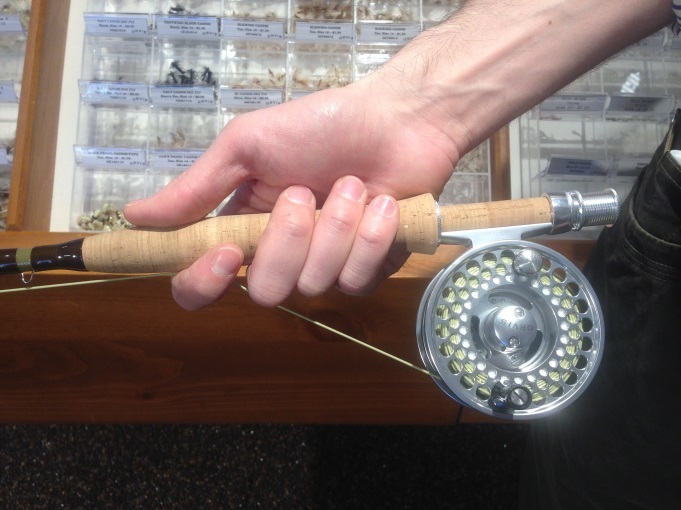 I see clients too often set the hook with the rod in one hand and the line in the other only to be stranded after the hook set with their hands five feet apart, and no way to retrieve the trout without creating a slack line. I do see creative anglers use their teeth to hold line while they strip, but that only works occasionally. The most effective way I’ve found to land fish after the set is to never remove the line from your rod hand trigger finger. Once you set the hook you use your free hand to strip line from just below your trigger finger (see photo) and you can rapidly make subsequent strips while never taking your eye off the fish. Constantly watching the fish and not your line allows you to react much quicker to any runs or direction changes. Work this trigger finger tip into your angling routine and I guarantee you will land more fish and more of the larger smarter fish that have developed fighting skills to outwit anglers. Brown Hobson is the owner and one of the guides at Brown Trout Fly Fishing LLC. Brown Trout Fly Fishing LLC is based in Asheville, NC and is ORVIS Endorsed. To ask questions about this article or to book a day of fishing with Brown call or E-mail. 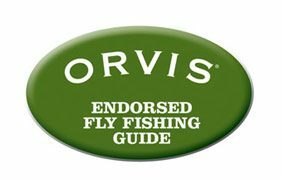 For more than twenty years, the Orvis Company has been recognizing excellence in sporting experiences through its Endorsed Lodges, Outfitters, and Guides (ELOG) program. Fly Fishing guide Brown Hobson has been nominated for 2013 ORVIS Guide of the Year. We are proud to have him on our staff. Call to book a trip with one of the top guides in the country. Orvis Trout Bum of the Week! The Orvis Company has given guide Brown Hobson the honor of being named Trout Bum of the Week. Read the interview at the link posted!